We rely on small-dollar donations to make our work possible. Support our mission today! AkPIRG is the only consumer advocacy and research organization in the state. We are a non-partisan, citizen oriented statewide organization focused on research, education and policy. We work on consumer and good governance issues, especially when inconsistent with moneyed, powerful or other special interests. In 1974 a small group of Alaskans formed a non-profit to protect consumers from big businesses intent on taking advantage of their customers in the name of profit. We power our efforts from the grassroots and rely on a small staff with big goals and a dedicated group of board members and volunteers to fully serve our mission and its goals. Please take a few moments to find out about our latest work and how you can help. We recognize that Alaska is a special place to call home. Our state is rich in resources, diverse cultures, and unparalleled geography. We believe that all Alaskans have a right to participate in shaping our state's future, rather than being at the mercy of corporate or moneyed interests. Currently our priority issues are Payday Lending, Railbelt Utility Efficiency, and Census 2020/Redistricting. We also regularly partner with other local, statewide, and national organizations on broader issues such as net neutrality, money out of politics, CFPB protections, and consumer awareness. "We must be the great arsenal of democracy." 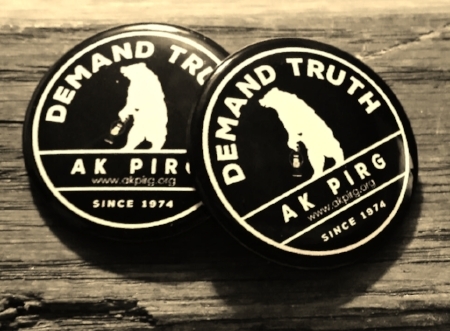 AKPIRG is committed to connecting Alaskans with reliable information about public interest and consumer issues. of Alaskan voters are registered non-partisan or unaffiliated. was reported to be paid to lobbyists in Alaska for 2018. Want to hold our elected officials accountable to their constituents by shining a light on government actions? What to curb corporate power and influence over the Alaskans? We have ways you can help! The Alaska Public Interest Research Group (AkPIRG) is a 501(c)(3) organization.